I feel that one should draw attention to the fact that in 1886 an American woman established certain emphases which succeeding critics followed, developed and extended in the twentieth century. This small book (published by Harper Brothers, New York) is a serious investigation of George Eliot's art, even employing the kind of language (Data Necessary for an Estimate of her Mind and Works') which links the scientific and the literary as a kind of consonance with George Eliot's own practice. As early as the second page there is an unequivocal assertion of the nature of her greatness - 'the name of George Eliot promises to hold, among the female novelists of England, that preeminent place which in France has long been conceded to that of George Sand'. In a succinct evaluation Abba Woolson attributes this to George Eliot's characterization, her observations of life, her 'searching analysis of motive', her humour, her wide learning and her depth of thought. She then proceeds to a more detailed examination of these, noting growth and development in character and the considered - what today we might call formal or structural - use of contrast. 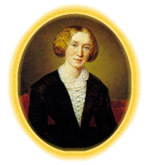 Woolson believes that in the later novels there is notable development in the nature of George Eliot's art. She praises the conception of Grand court and the maturity in the presentation of Gwendolen, which shows 'a precision of touch, and a refined, delicate sympathy of appreciation which she has never surpassed'. Impressive too are the portraits of children throughout her work (she is superior to Shakespeare here), but in case we should feel that she is not evenhanded in her judgements she mounts an attack on the character of Savonarola as given by George Eliot: instead of an inspirational if flawed leader, she considers him 'a petty, inconspicuous, intermeddling monk', failing to see the subtlety and the psychological intensity of the portrayal.